Home City Wise Architecture Is Dayton Street The Next OTR? On historic Dayton Street, revitalization happens slowly, one house at a time. John Hauck probably walked to work every day. This was true even on dark winter mornings, when he likely left the coal-fed warmth of his center-hall mansion at 812 Dayton Street to make the one-block trek to his brewery. The cobblestone road he traveled, known then as Millionaire’s Row, was lit with gas lamps whose soft light revealed dozens of homes similar in appearance to his own—a stately brick structure with an Italianate-style stone facade. Hauck’s late-1800s neighbors included other important men in the city—meat packers, doctors, attorneys, civil rights activists, a one-time mayor—and family members, too (his daughter lived next door; his son a few doors down from that). Shortly after the turn of the century, though, the street began to change. Affluent families like Hauck’s moved up Cincinnati’s hillsides, building new homes even farther away from the grit of downtown’s basin. Middle- and working-class families moved into Dayton Street’s once prestigious homes, and by the 1920s, most of them had been converted to multi-family dwellings. Hauck’s brewery was replaced by a pickle factory; gas lamps and cobblestones by fluorescent lights and asphalt. Hauck’s home became a museum and the neighborhood was established as an historic district in 1965. It underwent a mini-revival in the early 1980s, but the ever-expanding suburbs once again beckoned, downtown riots frightened away visitors, and soon Dayton Street, like the rest of the West End and much of downtown, sat largely undisturbed. Before long the weather-worn roofs on Dayton Street homes started crumbling and looters began stealing everything from doorknobs to bathtub feet and stained glass windows. It’s a story we’ve all heard before, the decline of a neighborhood in an urban area. And yet it’s not. Quietly, and in growing numbers over the past few years, Dayton Street’s homes are being lovingly restored and turned back into single family dwellings. Crown moldings have been recast and repaired. Walls gutted and brand new fixtures installed—everything from those missing doorknobs to toilets and tubs. A group of dedicated and hard-working homeowners is trying to make this back into a neighborhood where people will want to live. Not Millionaire’s Row, but not neglected either. Something vibrant and alive that respects the past and embraces the reality of the present. John Valentine (pronounced Val-en-teen), a young bachelor who serves as music director for Sacred Heart Church in Camp Washington, currently lives at 913 and has strong local ties—“my family was here from 1860 to 1987”; Gerald Bates, a former P&G-er who’s lived at 837 with his wife Linda since 1978; Kim McCarty, who moved here in 1999 with her husband (they have two sons, ages 12 and 14); and Joe and Robin Creighton, young newlyweds who are renovating 909 (they currently live in Over-the-Rhine). Joe owns The Rookwood and Cheapside Café, and Robin’s a photographer based in OTR. “Safe and clean and houses not falling down,” says Valentine. “I want to see kids running down the street playing with each other,” says Robin Creighton. And Bates would like “a more vibrant community,” including safe places to grab a snack or some last minute groceries, noting the time he tried to get coffee at a local restaurant and a dealer climbed into his car, assuming he was there to buy drugs. 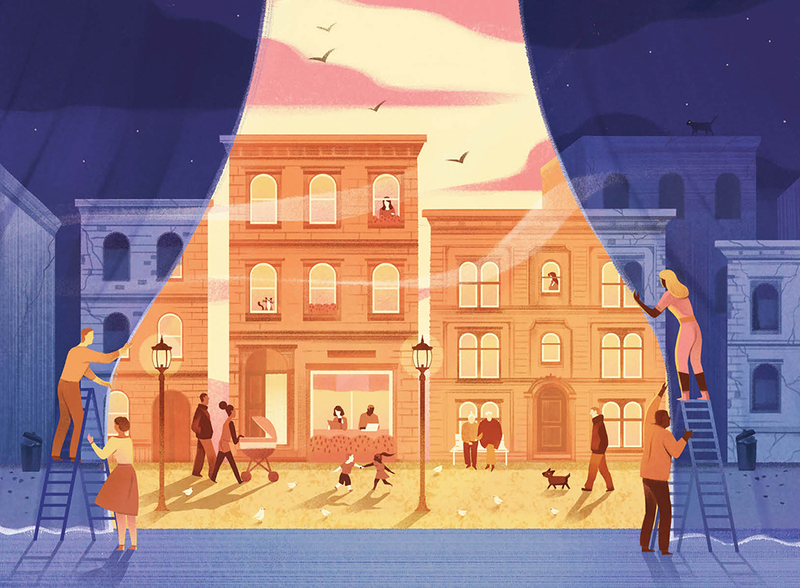 Still, from McCarty, who dons “rose colored glasses,” to Bates, who’s “not looking for suburbia,” all approach living on Dayton Street in a different way, and all demonstrate that there’s no one way to bring this place back to life, either. The one solution that’s not acceptable, they all agree, is holing up inside your own house, or sitting back and waiting for someone else to do something. Because “someone else” never really seems to come along. It’s a catch-22, though, because much of OTR’s success is due to the efforts of the Cincinnati Center City Development Corporation, which focuses on food, entertainment, and shopping (in addition to housing). Without those factors and—more important—without the backing of a wallet and network the size of 3CDC’s, revitalization efforts will always be slower and less guaranteed to succeed. If 3CDC isn’t the Dayton Street homeowners’ hero of choice, then who—or what—is? The group feels even the smallest efforts can contribute to re-growth: Valentine manages a website, daytonstreethistoric.org, to keep people informed; the newly formed Dayton Street Preservation Foundation keeps a close eye on neighborhood happenings (McCarty and Bates are both board members); the district’s status as historic was expanded last year; a house tour last fall drew almost 1,000 people, says Valentine; and, with help from the West End Community Council, the former Neighborhood Association raised enough funds to purchase and install a new sign fronting Linn Street (it was made from the facade of the former York Street Police Station). Plus, they’ve all solicited friends to buy homes nearby. Most recently, Joe encouraged his business partner, Rom Wells, who ended up buying 929. Still, if Zada doesn’t get the loan approvals it needs to move forward on renovations, there’s no telling if the developer will retain the properties; in a worst-case scenario, the schools could end up something like the Terrace Plaza on Sixth Street—a giant pawn in a real estate game involving constant ownership changes and untold years of vacancy and neglect. As for balanced incomes, woven among the newly renovated single family homes are some that house low-income tenants. The interiors are divided into multi-family units and the exteriors are well-kept. Still, as Valentine walks the neighborhood, his tiger-striped mutt, Mary, in tow, he points out that low income housing tenants aren’t always the best neighbors. They are prone, he says, to unemployment and loud partying at all hours. Just then a young African-American boy appears in the front yard of one of the multi-family homes. He’s about 10 and he’s standing, alone and silent, behind a wrought iron fence. The gap between his yard and the Hauck House is only a few hundred feet, but in that moment it seems more like a few hundred miles. Two weeks later, Joe and Robin are giving an impromptu tour of their new place—pointing to where stairs have been ripped out and new showers will be installed. Robin excitedly points out a patch of original wallpaper nearby. Valentine’s there too, and seems elated at the thought of finally having next-door neighbors. They joke about installing a tunnel from house to house.